A year ago today, religious right activist and member of Evangelicals for Biblical Immigration David Barton posted the following video on his Facebook and YouTube accounts. In the video, Barton chastises progressives for questioning his claim to have an earned doctorate. He said he has an earned doctorate but that he has chosen not to talk about it. However, the next day Barton chose to take the video off of both websites and chose not to talk about the reasons why. diploma mill. According to the president of Life Christian University, Douglas Wingate, Barton didn’t attend the school but was given credit for his historical writings. Even though one cannot meaningfully call a degree earned when you don’t take any classes, that is exactly what LCU does with famous preachers and religious leaders. The state of Missouri advised fellow LCU degree recipient Joyce Meyer that her claim of an earned PhD from the school was against state law. Meyer’s lawyer responded that Meyer had already decided that describing the LCU PhD as earned was false. Meyer now describes her LCU degree as honorary. Although that description is legal in Missouri, LCU’s is not accredited by a Department of Education recognized accrediting body and the status as a university is unusual since the school is registered with the IRS as a church. Barton called his degree earned but sarcastically dismissed the honest reporting of what he called progressives. Barton has never explained or apologized for his demeaning and misleading statements. Yet, he still claims to be “America’s premier historian.” Would “America’s premier historian” try to pass off what can only be called an honorary degree as an earned one? As of now, America’s premier historian has chosen not to talk about it. 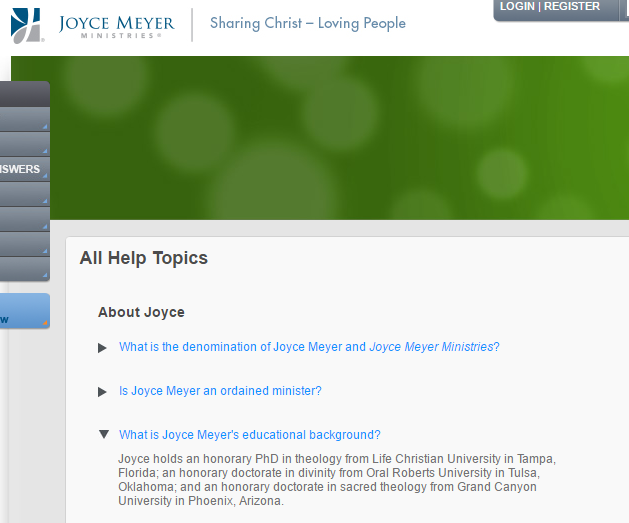 Joyce Meyer Ministries: Life Christian University's Description of Earned Doctorate Does Not "Accurately Reflect the Information Correctly"
On October 7, I reported that evangelist Joyce Meyer claimed to have an earned PhD in theology from Life Christian University. She claimed to be a graduate on a promotional video still housed on the LCU website and said the degree was earned on her website. On October 11, I filed a complaint with the Missouri Attorney General’s office in keeping with MO law which forbids the use of false and misleading degrees in connection with one’s business or profession. 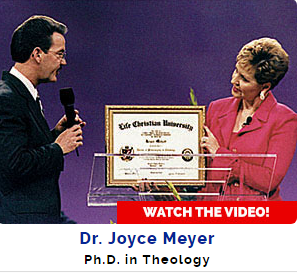 Sometime after the initial post and the AG complaint was filed, Joyce Meyer Ministries changed the designation of the LCU degree from “earned” to “honorary.” I know the change happened after the complaint was filed because the degree was described as “earned” on October 15, 2016 (from the Wayback Machine on Oct. 15). I discovered the change in November. While we are aware that this is the verbiage that Life Christian University uses on their own website and literature, we simply felt it did not accurately reflect the information correctly. Because of this we took the initiative to change the wording on our website and literature from “earned” to “honorary” before this complaint was filed. Missouri’s law is one of the toughest in the nation on false and misleading degrees. Other LCU “distinguished degree holders” from MO include Billye Brim and Larry Ollison. Author Warren ThrockmortonPosted on April 23, 2017 Categories david barton, diploma mill, Life Christian UniversityTags diploma mill, Douglas Wingate, Joyce Meyer, life christian universityLeave a comment on Joyce Meyer Ministries: Life Christian University's Description of Earned Doctorate Does Not "Accurately Reflect the Information Correctly"
The day after he posted the video, he removed it from his Wallbuilders website and Facebook page. He has never addressed why the video was up for a day and then gone. Barton ridiculed progressives for disbelieving his claim to have an earned doctorate. Then all of a sudden the video was removed and he stopped talking about his doctorate. None of the people who rely on his work apparently care that he claimed to have an earned doctorate when in fact it came from diploma mill Life Christian University. The claim just vanished as if it never happened. Will Barton ever address his claims? For the rest of the story, see these posts. Nearly three months ago, David Barton proudly proclaimed that he had an earned PhD. The very next day he removed the video claim from his websites and never explained why. 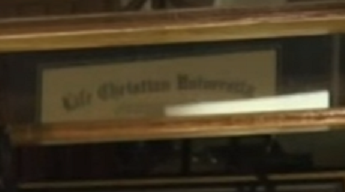 We later learned that Barton’s earned degree came from Life Christian University, a diploma mill based in Lutz, FL. Barton’s degree was given based on his published works in history which Life Christian considered to be part of Church history. Now, via another statement from Life Christian University, more details are available about Barton’s so-called earned degree. According to LCU, “earned” PhD degrees are awarded based on published works. 1. We accept a student’s earned degrees from other institutions based on their official transcripts. 2. We award credit for published works commensurate with the amount of writing required for a Master’s Thesis or a Doctoral Dissertation. Please note that earned degrees based on published works are all issued only from our Main Campus in Tampa, FL, and say that clearly on the degree certificate. The Doctoral-level dissertation must be a minimum of 150 pages in length. It should not exceed 160 pages. The Master’s level thesis must be a minimum of 50 pages in length. It should not exceed 55 pages. With those skimpy guidelines, anybody who has self-published a book would be eligible for LCU’s highest honor. The credit LCU awards for an earned degree don’t include any academic work as a part of a program. In other words, the degree is not actually earned and, if it has any status at all, it would have to be considered an honorary degree (as Joyce Meyer recently relabeled her LCU PhD as required by law in MO). The guidelines don’t address what happens when an author’s book is pulled from publication due to errors. 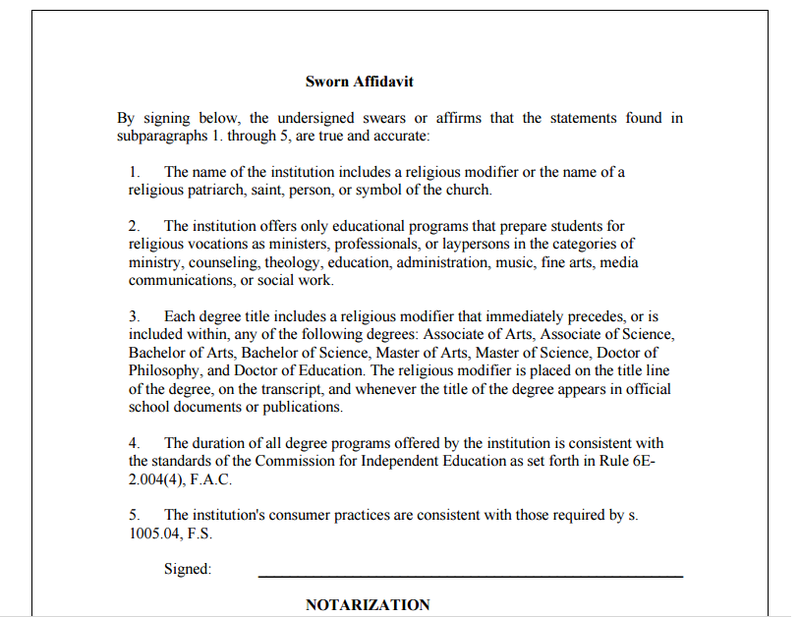 If LCU was in compliance with FL law, no degrees outside of religious degrees would be offered. However, in Barton’s case, LCU has made an exception. As a University with religious exemption, we only offer degrees that fall under that exemption. Church History is part of our curriculum. Dr. Wingate feels that the founding of America and our country’s involvement in the unfolding of God’s plan for the nations of the world is one of the top topics of Church History for the last 400 years! If America had a state church, then one might make this case. However, Wingate’s stretching of the truth is obvious for all to see. Furthermore, Barton claims expertise in “historical and constitutional issues,” not church history. A review of Barton’s books doesn’t turn up themes which comprehensively deal with the history of the church in America. TH-431 CHURCH HISTORY This course teaches the student the origin of the Christian Church, its birth, and its development from the Day of Pentecost through modern times. Obviously, this course does not address America’s political history. It also should be obvious that LCU’s faculty isn’t qualified to assess Barton’s work as a matter of history, church or otherwise. How long will Barton and LCU carry on this charade? Now she accurately refers to the degree as honorary. 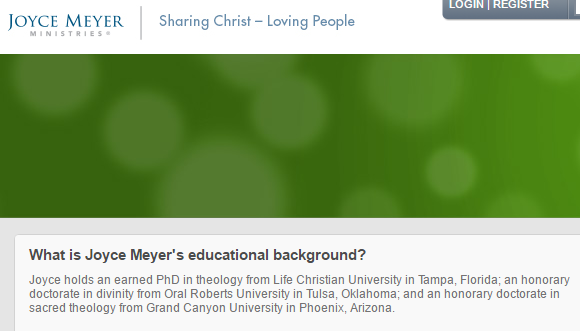 David Barton referred to his Life Christian University degree as earned but where it is illegal to do so, Joyce Meyer changed the description. Recently, Christian Today posted an article about mega-evangelist Joyce Meyer’s and self-styled historian David Barton’s PhD degree from Life Christian University. In it, LCU’s president Douglas Wingate was quoted in support of his school’s work. I have obtained the entire statement and am posting it here. I began looking into LCU when David Barton posted a video boasting about having an earned doctorate. The next day he removed the video and has not mentioned his PhD since. Although Barton points to the diploma while on camera, the identity of the school is hidden by one of his honorary degrees. Through enlarging the screen, I was able to determine that the source of the degree is LCU. In this statement, Wingate confirms the source of the degree. Given the statement Wingate provided, the description of the degree as being earned doesn’t seem accurate. For background on the issue click here, here, here, here, here, here, and here. Life Christian University is a ministry education institution that is designed to provide training for future ministers who desire to “rightly divide the word of truth” as described in the original doctrines of the New Testament. Though many professing Christians assume that their positions reflect what the Bible teaches, if they alter the operation of the Church and it’s theology in any fashion that does not resemble the miracle power and glory of the first century church, they are missing much of what is available to the born again believer. Because of this disconnect with much of modern Christendom, LCU receives criticism from parts of the Church, and certainly from the unsaved people of the world system who criticize Christian academics altogether. Life Christian University is not moved for a moment by any criticism from those who simply do not qualify to comment on our beliefs and practices due to their spiritual ignorance, but we validate every position we teach through deep study of the Word of God, without religious influence. For those who question the legal status of our operation, Life Christian University is exempt from licensure in the state of Florida, but does submit to the laws governing religious institutions with annual verification of compliance with the Commission for Independent Education, a division of the Florida Department of Education. Within this structure LCU provides ministry education in various spiritual disciplines for earned degrees at its main campus in Tampa, Florida and through licensing its curriculum to educationally qualified remote locations in various churches throughout the US and many foreign countries. LCU also offers an online program delivered from the main campus faculty, and available to anyone through the cyber-world who can access our web site and study in English. Our first course is free and available for anyone to view and listen to the lectures and read the free online textbook. Enrollment is not required in order to study the first course. It seems that questions have arisen concerning various well-known ministers of the Gospel who we refer to as Distinguished Degree holders. These ministers are not graduates of LCU but are those for whom we recognize the comparable academic work in their published teaching materials, many of which we use as texts in our university, and we have matriculated degrees for their work. As with any regularly enrolled student, when we do an assessment on the former education that a student desires to transfer into LCU, we consider any former Bible School credit, liberal arts school credit, Bible School teaching credit and Published Works credit. It is a common practice for even secular liberal arts institutions to offer Life Experience credit. When a minister has enough credit beyond their customary transfer credit, LCU is able to matriculate degrees for each of the various levels of credit. The first degree is the Bachelors degree, then the Masters degree, then the Doctor of Ministry degree and finally the Ph.D. The necessary credit hours of study that match these degrees is 120 credits of undergraduate study for the Bachelors degree, 36 credit hours of graduate study for the Masters degree, 15 hours of post-graduate study plus a 30 credit dissertation for the D.Min. and 15 hours of post-graduate study plus a 30 credit dissertation for the Ph.D. Again, these degrees may consist of transfer credit, and previously published works. This work, of course, must be for that which falls into the disciplines traditionally offered by the university, but an exception can be made for some work that is outside of, but related to those disciplines. One such discipline would be in Christian American History, which falls into the category of Modern Church History. All of the candidates work is thoroughly examined before credit is awarded and it is clearly identified on their transcript. That is certainly the case with Dr. David Barton, whose work in comparison to the revisionist historians, make them look completely foolish. Some unsaved liberal academics are drastically opposed to our methods of assessment for earned degree credit, but they need only to concern themselves with their own anti-Christian and often Anti-Christ secular schools, which LCU has nothing in common with. Unfortunately in America, many of these institutions were founded as colonial seminaries, and early American seminaries. It is a tremendous blight on our nation that these secular education institutions have fallen so far from the grace of God, and are now tools of the enemies of God. The pendulum seems to have swung from godliness all the way to demon possession. When critics complain about the independent, non-government accreditation that we have obtained, as opposed to secular government accreditation, my question is, “Why should the ministry education institutions subject themselves to unbelievers for academic oversight about education that they are absolutely ignorant of?” You wouldn’t ask a prostitute for their opinion on whether or not a virgin should remain pure until she is married. Neither should we subject ourselves to the scrutiny of the spiritually ignorant. We do not offer any liberal arts in our programs, nor are we in competition with any liberal arts institutions, and therefore do not receive any government monies for our educational programs. In a way you could say we also believe in the separation of church and state. We simply believe that the state should not be involved in the church’s ministry education. In reality, since the first institutions of higher learning in America originated in the church, it seems that the liberal arts institutions should have to come to the church for accreditation. It would certainly change things if they had to meet our standards of spirituality and morality. Finally, LCU does offer Honorary Degrees to some highly experienced ministers who do not have the formal education, but certainly have the equivalent ministry education, obtained on their own in a non-formal setting. A few of our distinguished degree holders fall into this category. The degrees that they have received are customarily the Doctor of Divinity degree, or Doctor of Sacred Music degree. In answer to the question about whether we should change the status of our matriculated degrees to honorary degrees, the answer is emphatically, no. It is simply imprudent to compare apples to oranges, and the function of ministry education institutions do not compare to the lower forms of education offered in the secular liberal arts institutions. Those institutions should simply continue doing what they do, and we will simply continue doing what we do. One day we will all stand before the judgment seat of Christ and be face to face with Jesus himself. Believers will stand before him to receive our rewards for faithfulness to His call on our lives, and unbelievers will face him as Judge, jury and executioner. Then all of these questions will be eternally put to rest. Wingate claims that Barton’s work in “Christian American History” falls under the category of “Modern Church History.” Wingate has to do this because LCU is only allowed to give degrees which have a religious word in the name and train people for work in the church. I would like to see Barton’s LCU transcript to see what experiences and books were counted as credits. Was The Jefferson Lies counted? How about Original Intent? Barton means these books to make authoritative claims about American history without any reference to religious vocation. One reason religious schools are exempt from licensing as post-secondary schools is because they are training people to perform religious functions. The state rightly allows churches to determine what training is needed to perform religious duties. However, Barton claims he has an earned degree while purporting to do the work of a historian. If he claims his degree is in some kind of history, a strong case can be made that LCU has gone beyond what it is allowed to do. In any case, religious or not, the claim that the “Distinguished Degree Holders” have earned degrees is preposterous and misleading. Wingate isn’t fooling anyone. It is time to stop the charade. Life Christian University Confirms David Barton's "Earned Doctorate"
Now it seems sure that the degree Barton called earned was given to him by LCU. According to a statement to Christian Today from Life Christian University president Douglas Wingate, Barton’s written history works were considered as an aspect of awarding a doctorate. Wingate was quoted in an article today by Mark Woods at Christian Today. These ministers are not graduates of LCU but are those for whom we recognize the comparable academic work in their published teaching materials, many of which we use as texts in our university, and we have matriculated degrees for their work. A matriculated student is one who is enrolled in a degree program. Wingate says these “distinguished degree holders” didn’t graduate. Elsewhere Wingate has said they didn’t attend. If they didn’t attend or graduate, there is no meaningful way to describe their degree as “matriculated.” In short, he just added up any previous academic work somewhere else and added enough credit to get to a PhD without any attendance at LCU. By federal definition, this is what diploma mills do. No wonder Barton wanted to hide the LCU degree behind one of his honorary degrees. If words mean anything, the degree can’t be considered earned. Of course another problem with the degree is that it may be in Christian American History. One wonders who at LCU is qualified to judge whether or not Barton’s history is accurate. The answer is no one, because LCU president Wingate allowed the student to be the teacher. Here is what Wingate said about Barton in relationship to his critics. One such discipline would be in Christian American History, which falls into the category of Modern Church History. All of the candidates work is thoroughly examined before credit is awarded and it is clearly identified on their transcript. That is certainly the case with Dr. David Barton, whose work in comparison to the revisionist historians, make (sic) them look completely foolish. A little later in the statement, Wingate admits that LCU doesn’t offer liberal arts courses. How could Barton get a degree in history from an institution which doesn’t offer history courses? As an exempt from licensing school in FL, LCU can’t offer degrees in anything other than ministry. Perhaps, Barton took the video down because the use of a fake or misleading degree is illegal in Texas and other states. In any case, he has some explaining to do. Author Warren ThrockmortonPosted on October 10, 2016 Categories david barton, Life Christian UniversityTags david Barton, diploma mill, Douglas Wingate, life christian universityLeave a comment on Life Christian University Confirms David Barton's "Earned Doctorate"
As a religious school in Florida, Life Christian University is not required to obtain a license from the FL Commission on Independent Education if the school adheres to five requirements. Each year, exempt schools must file a sworn affidavit to the Commission and if accepted, the Commission will issue an exemption letter. According to the Commission website, LCU has received a letter of exemption. Having reviewed the state requirements and LCU’s website and materials, I am of the opinion that the Commission should reconsider the exemption. LCU clearly conforms with points 1 and 2. The school name has a religious modifier and the programs are religious in nature. LCU appears to meet the requirements in point 3. However, I cannot verify this since I have not seen transcripts or any of the diplomas up close. In the pictures of “distinguished degree holders” and David Barton’s video, it is not clear how the degrees are labeled. LCU does not appear to meet the requirements of points 4 and 5. The rest of the post provides evidence for my opinion. LCU’s course schedule for 2016-2017 lays out the schedule Bachelor’s students are expected to follow for the first years. The fourth year allows some flexibility for specialization. Each year is the same in that 9 three credit hour courses are required along with a three hour practicum experience to make up a total of 30 semester hours. At the end of four years, student following the program accumulate 120 credits to graduate with a Bachelor’s degree. Classes are held in three hour blocks on Monday nights. Three credits are awarded for 12 clock hours of class time. LCU’s website spells it out. Each 3-credit-hour course meets for 3 clock-hours once per week. Over a period of 4 weeks, the required 12 clock-hours of class time is accumulated. You should allow for at least two 10-minute breaks during each 3-hour class session. According to LCU’s course schedule, it only takes four weeks of meeting three hours/week to complete 3 semester hours. This means that each credit requires only 4 hours of class time. In the image above, one can see that students attend school three hours on Monday night and take one class at a time. Students are credited with 3 semester hours for those 12 hours of attendance. As I will demonstrate, this is significantly less than state law requires. According to point 4 in the law, even exempt schools must match degree duration requirements. According to the affidavit (see above), the rules for degree duration are detailed in the FL Administrative Code Rule 6E-2.004(4). The duration of all degree programs offered by the institution is consistent with the standards of the Commission for Independent Education as set forth in Rule 6E- 2.004(4), F.A.C. Section 4 of Rule 6E-2.004 is a long section dealing with the requirements for licensed colleges under the Commission. According to the affidavit, the only applicable standard for a religious school is that the duration of degrees is consistent with these guidelines. The rules lay out guidelines for associates degrees through doctorates. For our purposes, I will focus on the Bachelor’s degree. Here are the guidelines for an acceptable Bachelor’s degree. (p) The following instructional program standards apply to bachelor’s degrees: 1. Program specifications: The credential offered shall be the Bachelor of Science Degree, Bachelor of Arts Degree, or other baccalaureate degree title considered by the Commission to be appropriate and not misleading. The duration of the program shall be a minimum of 120 semester credit hours, 180 quarter credit hours, or the recognized clock hour equivalent. The required general education component for a Bachelor of Science degree shall be a minimum of 30 semester credit hours, 45 quarter credit hours, or the recognized clock hour equivalent. The required general education component for the Bachelor of Arts degree shall be a minimum of 45 semester credit hours, 67.5 quarter credit hours, or the recognized clock hour equivalent. The general education requirements for other bachelor’s degrees shall be appropriate to the specific degree. Applied general education shall not be utilized to fulfill this requirement. All general education courses must meet the definition given in subsection 6E-1.003(38), F.A.C. Unless otherwise required by the accrediting agency, a minimum of 15 of the required general education credit hours or the recognized clock hour equivalents must be obtained at the bachelor’s level. (b) Planned learning experiences equivalent to the learning and preparation described in paragraph 6E-1.003(55)(a), F.A.C., above, as determined by duly qualified instructors responsible for evaluating learning outcomes for the award of credits. Section 55(b) may be a loophole for LCU. However, according to the LCU FAQs, students only have to read at minimum 250 pages per course (less than most textbooks) and do four papers in an entire year. I think 55(b) is meant to include independent studies which are normally conducted outside of a formal classroom but are “equivalent” to the 15 clock hours of instruction described in section 55(a). Florida’s duration requirement for one semester credit hour is 15 clock hours. LCU requires 12 clock hours to receive 3 credits which comes out to 4 clock hours per semester credit hour. LCU students are scheduled for 108 clock hours/year which comes out to 7.2 semester credit hours/year. Adding in the 3 semester credit hour practicum and students are getting the equivalent of just over 10 semester credit hours/year. At that pace, it could take about 12 years to complete a degree using state degree duration guidelines. I don’t think LCU should swear that they meet the state’s degree duration requirements. The institution’s consumer practices are consistent with those required by s1005.04 in FL law. (h) Publish and follow procedures for handling student complaints, disciplinary actions, and appeals. (2) In addition, institutions that are required to be licensed by the commission shall disclose to prospective students that additional information regarding the institution may be obtained by contacting the Commission for Independent Education, Department of Education, Tallahassee. History.—s. 247, ch. 2002-387; s. 45, ch. 2004-41. Since I am not privy to all of the materials given to students or professors, I can only evaluate letter (e). Given what I have learned about their degree duration, I don’t think LCU reasonably passes that standard. One problem is labeling honorary doctorates as “earned degrees.” The degrees LCU has given to “big name preachers” who did not even attend cannot be considered earned. LCU is rapidly becoming known as one of the premiere ministry universities in the world. With its quality program, miraculous growth rate and great number of prominent and distinguished ministers who have chosen LCU for recognition of their academic work, a degree from LCU is one of the most prestigious degrees available. Life Christian University has fulfilled rigorous educational requirements in our determination to acquire and maintain a quality educational program. LCU is a state-authorized school, recognized by the Florida Department of Education’s Commission for Independent Education, having fully met and exceeded the requirements of state law. Additionally, in each of the many states where LCU has campuses, we have met and exceeded the requirements of their State Departments of Education as well. According to the rule above, LCU should explain that the school is exempt from most requirements and is not licensed. Clearly, the school does not meet the requirements of state law when it comes to amount of instruction required to assign semester credit hours. Finally, for IRS purposes, LCU is a church and exempt from the requirement to file a 990 form. 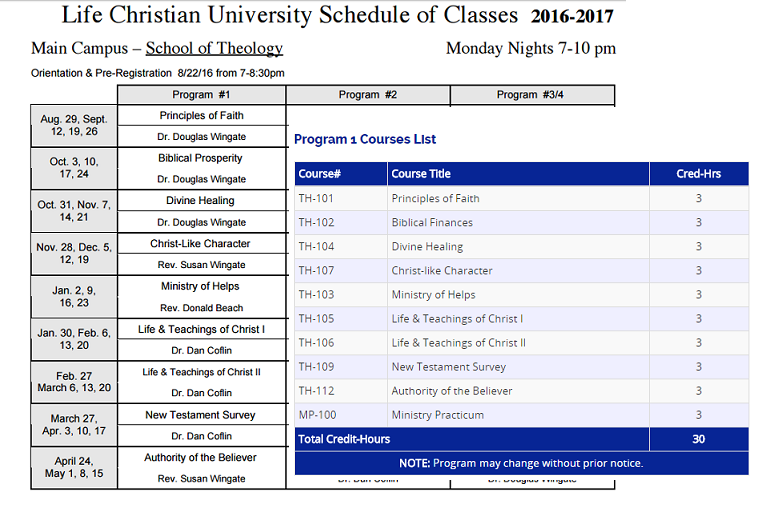 Perhaps this is common with unaccredited schools, but there is no hint in any of the educational materials I have seen that LCU is a church. This too seems misleading. In a future post, I plan to discuss the accrediting body used by LCU. 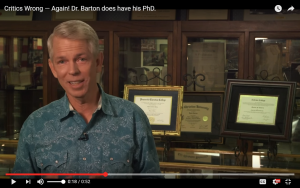 Is David Barton’s PhD from Life Christian University? Last week, self-styled Christian nation historian and and Donald Trump supporter David Barton crowed that he possessed an earned PhD. In a video posted to his YouTube account, Barton chastised “progressives” for saying he did not have a PhD. In the video, Barton told viewers that he had an earned PhD but did not say where he got it. In the background, three diplomas were displayed but one of them was partially hidden behind honorary degrees from Ecclesia College and Pensacola Christian College. However, enough detail could be seen to identify the mystery degree as a diploma from Life Christian University, an unaccredited school based in Lutz, FL. The next day Barton took down the video without explanation. The distinguished ministers shown on this page are some of the most renowned preachers and teachers in the world today. Many are recognized throughout the entire world, but all of them are famous in heaven. It has been the privilege of Life Christian University to recognize their published works, along with their lifetime ministry achievements in consideration for earned degrees from LCU. Doctorates in Ministry, Missiology, Theology and Philosophy are all earned degrees, recognized for the highest level of academics and spirituality. LCU is honored to be associated with God’s greatest ministry gifts given to the Body of Christ today. It sounds like LCU simply conferred a degree without any actual work. Wingate: Big name ministers? What we’ve done in their cases; they haven’t attended Life Christian University but we’ve, we were able to recognize all of their scholarly work, their published material, whether it’s print materials or things that they’ve put out in teaching CDs and everything. And so Dr. Kenneth and Gloria Copeland, Joyce Meyer, Benny Hinn, the list goes on and on and on, and the Lord’s just given us grace and favor to be able to come along side. We use their books in the university, we use theirs as textbooks. So to us it’s an honor to be able to recognize their academic work and the things that they’ve done for the Kingdom of God and so the degrees that they have are earned degrees. So we stack everything up, you know, from all of their teaching, their former education, everything else, all the way through their doctorate degrees and issue those. Now there are a number of them that haven’t published as much and whatever and so they have some honorary degrees, but we know they have the equivalent ministry education. But you can go on our website, that’s LCUS.edu and take a look at all of those distinguished degree holders that we have, that we’re so proud to be able to be associated with, and labor in the harvest with them. LCU is exempt from Florida’s law governing independent education. However, even exempt schools must meet some standards, including one about degree duration (1005.06-1.f.4). 4. The duration of all degree programs offered by the institution is consistent with the standards of the commission. The Florida Commission for Independent Education sets standards for the duration of earned degrees and not even being enrolled in the school isn’t consistent with those standards. Schools like LCU are permitted to award honorary degrees but they must be clearly labeled as honorary degrees. By any definition, the degrees given to people who didn’t attend the school cannot meet the standard for an earned degree. As I will demonstrate in a future post, I think LCU may be in violation of additional facets of the rules governing exempt schools. David Barton opened a can of worms last week with his proud video.